Memory wire is a spring-like wire that holds designs snug against your skin. It is an economical wire and is easy to use. Stainless Steel with silver colour easily matches other silver-plated jewellery-making materials. This is not your usual ugly grey memory wire. 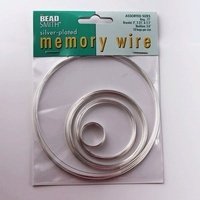 The plating on BeadSmith®'s stainless steel memory wire provides a rich, beautiful lustrous colour worthy of showing off - you can create your own beautiful and unique jewellery using just a few leftover beads!